Britain has voted for Brexit. What comes next is remarkably unclear. James Strong argues that four questions remain: whether to invoke Article 50, what mandate the Leave campaign possesses, what sort of exit deal Parliament will approve and what will happen if there is an early general election. Not for big fish in suits from hugo boss. They will decide what “leave” means. A simple stance … i.e. straight-forward and simplistic, the complications of the real world are brushed aside. I agree, leave is what the democratic vote stated so the politicians in power need to negotiate what Leave stated, our own sovreinity and control of our borders, if the EU says the Single Market is on the deal of free movement of people; the politicians have no choice but to reject it. More worrying at the moment is the way MP’s are behaving, Scotland who only voted in 2014 to remain in the UK is not accepting the democratic will of the UK to Leave the EU; Nicola is ignoring the mandate of the Scottish people who voted to accept the UK Government and acting as if Scotland is suddenly a seperate counrty passing a motion in Hollyrood giving Scotland a mandate to have discussions with the UK Government, other devolved administrations, the EU Institutions and member states to explore options to protect Scotland’s place in the EU. This is clearly MP’s acting on their own accord over and above what the electorate voted for, and it is happening in the Labour Party too. Jeremy Corbyn was voted in resoundingly by the members of the Labour Party, but the MP’s were not happy with the member’s choice (see the Daily Telegraph articles since Jeremy’s election with MP’S complaining about Corbyn selection) so the MP’s have decided they know better than the electorate, here we have MP’s thinking they are above the electorate forgetting they are their to do the will of the people not to do what they want. The referendum was about a political class who have forgotten that they are there to serve, thinking they own the place, doing whatever they want and forgetting the electorate who put them there. Its about time the politicians realise things have changed, democracy is democracy and we will no longer let the Etonians or the aspiring Etonians do what they want and forget they are here to serve us, that’s what this vote was about….. the established order is crumbling and we need a new way of doing things, one where politicians tell the truth, one where politicians respect the wishes of the electorate and act for the people, by the people…. the revolution is happening. time will tell if the leave needs to be reconsidered. Only a silly person draw a line in the sand at low tide and says its immovable. “Leave means leave” ? Really? Boris Johnson has said there is “no need for haste” after the UK voted to exit the European Union. Mr Johnson also sought to reassure those who voted Remain saying: “We cannot turn our backs on Europe. We are part of Europe”. I’m interested in the 3million jobs linked to the EU and the 44% of exports that go to the EU. What will happen to them? Leave means leave. You cannot make it mean something else. There will not be another EU referendum. Are you silly enough to claim that 3 million jobs will go? As to the 44% of exports that go to the EU [some of which are re-exports by the way] there will be tarrifs both ways on exports & imports. The EU has a massive trade surplus with us, ask the Germans.. The people have decided. It is not open to sore losers to ask fror a replay. I wouldn’t be too sure of yourself Jim Farr, there’s a long way to go yet. It’s a mere four months since Boris the Opportunist decided to back the Leave campaign, prior to this he had always been an advocate of remaining in the EU. What makes you think he won’t have another change of heart? Let’s see how he feels when he’s achieved his ultimate goal of leading the Tories and becoming PM, then renegotiating the terms of our membership of the EU with the weight of the electorate’s mandate behind him? Sorry to break it to you, but ‘Leave’ does NOT necessarily mean ‘Leave’! Thankfully. 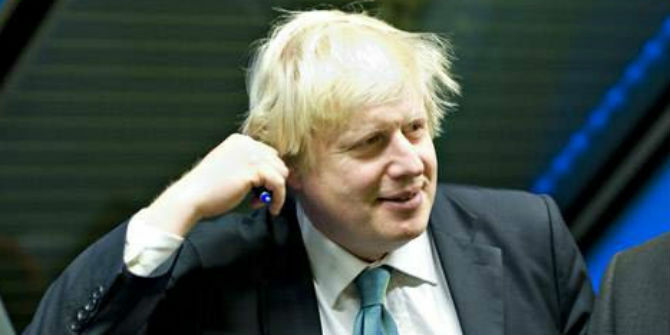 It does not matter if Boris has a change of heart or an epiphany. Carved in stone. No government is going to say to the people that their decision given in a referendum is not to count. What are they to say? Sorry but you don`t know what you have done – you are a simple minded lot, so let the intelligentsia take a crack at it on your behalf. Where are you going to find politicians that stupid? “stupid” – I think the word you meant to use was “honest”. As you say, not much chance. It would be interesting though Jim, if after a cooling off period and the realisation that a lot of the Leave vote was based on lies fed to these voters…How they would not vote? What concerns me is at the start of the campaign, the prime minister and in some respect parliament gave the voters as choice to choose whether to stay in Europe or to leave and if one side loose the vote. They then have to accept that they have lost and try to work together for the best of the country. That is how democracy works, parliament then carries the wishes of the people who won. But what concerns me and I guess a few other people, is that parliament is now saying that even so the other side one the vote. They did not understand what they was voting for, so there for they should be treated as little children and stand in the corner for doing something wrong. If they do that, they will loose the trust of the voters and more importantly they will damage the trust in democracy. Then where will we be. There is noting carved in stone. Maybe you were not aware of that, but the referendum was, legally speaking, a non-binding referendum. In other words, the government and the parliament asked the British peoples (plural, yes) their opinion. If this was sold to you as a legally binding referendum, somebody duped you, and you were wrong to believe them. Now, I am not saying that the parliament could ignore this, or that it would be the right thing to do to do so (in fact, I think that it would be wrong) but 1) it still has to pass a parliamentary vote (by a qualified majority, probably 2/3 of the House of Commons, on this I am not sure, but it is at least the majority) and 2) it probably has to be voted separately by the Pàrlamaid na h-Alba and the Parliaments of the other devolved regions (Wales and North Ireland). Also, since in the British system a MP is bound to his or her constituency, a MP needs serious motives to vote in a way that differs from the majority of the constituency. This is the way democracy works in the UK: it is a representative democracy after all, a method that has guaranteed governability and stability for centuries, so, albeit imperfect, it has value. This means that the brexit vote is very important and it has to be taken seriously, but it is only the first step in a complex road towards Article 50. And if the road ends with staying in the EU, or with England and Wales leaving, Ireland reuniting and Scotland leaving, all of these options would be perfectly valid in a democratic framework. Leave clearly does not mean leave.. The people?? What about those who voted stay? And if the majority weren’t misinformed, they would have voted stay too! Of course leave means leave. Otherwise why ask the question? If Remain had won would you be saying Remain did not mean Remain? Sore loser ? Maybe Boris has become a “sore winner” or should that be “sore whiner” or sore wiener ? you say ‘sore looser’ Jim like it was a popularity contest. Is your hatred of the EU and our European friends so great you would sacrifice the economy and millions of jobs – just for the pleasure of saying “Go home Polish scum’ ‘ YOU Will lose. Your kind have no place in the modern world.. You offer nothing and will get nothing in the end except the hate you have unleashed back a hundredfold on yourselves. Reply to Gavin Thompson. You are the one who is demonstrating pure hatred. Your comment is a disgrace. Is there recognition of the idea that the leave vote was a ‘generally disaffected’ vote? My fear is that people who feel that politics doesn’t represent them and/or that society doesn’t give them what they need will have voted leave because it represnts change. The concern is that they haven’t given thought to whether it is the right change. It really does not matter if every single person who voted for Brexit was drunk. What are you intending to do – ask for another referendum because you feel that maybe this one was some sort of mistake & if that second one goes your way a Brexiteer can also ask for a third referendum because your victory was not kosher? The people’s vote is not binding on the people though. To take your example: if every single person who voted for Brexit was drunk, then if they all changed their minds when they sobered up, then yes, they could have another referendum and change the result. I’m not optimistic it will happen, but Parliament may yet force the issue at a General Election in which – following the negotiations with the EU – either or both Conservative and Labour offer an In platform. If returned to power, they would have a mandate to stay. Constitutionally this referendum is not binding on this Parliament, although it will be treated as though it were. Have you spoken with your own MP? I have talked with my MP. Look, if parliament throws out the referendum result & initiates a new referendum what will happen at the following general election? Each MP who voted out this referendum result will face the wrath of the people & most if not all would not get re-elected. The will of the people will be respected by parliament. I will leave this forum now as my purpose is served. It has been an emotional roller coaster for all who are passionate about Brexit & Remain. Now we have a country to help & our people to care for in our own modest way. What are you even talking about?!!! If I was drunk when I voted, then I would have to live with the result. Those voting Brexit were cold hard “sober”. And possibly the only side that had 100% turnout. Please try to understand that it did not go the way you planned because you were complacent and now have to live with not having taken us seriously. All revolutions have happened this way. Jim, if your doctor tells you , that you have cancer do you go home and die? or do you ask a specialist for a second opinion. This is in effect what the leave vote is too many. A terminal no coming back from decision. whats the harm in a second opinion? Do you fear it? If your so confident that it should be of no issue to you. That it is, tells us a lot. It tells us you are unsure in your position and probably well aware a second vote will reverse the first. Thats why a referendum in a democracy is often called the imperfect democracy. I think there is some scope for buyers’ regret, especially if the economy takes a big hit. Widespread reports already this morning of leave voters who voted as a protest and didn’t expect to win. They might be willing to vote differently in, say, a future general election. But it’s also clear a large number of people genuinely see leaving the EU as a possible solution to real problems, especially immigration and wider problems associated with immigration like shortages of good jobs, housing, school places and medical services. What is unclear is what proportion of the leave vote was a vote to cut off EU immigration, and what proportion was a vote to regain sovereignty but keep strong trade links. Since we probably can’t both cut immigration and keep trade links, it does matter that, at the moment, it’s unclear which option the vote calls for. The default will be to cut trade links and cut immigration, and I suspect that’s the most likely option. But many people in the government, including Boris and Gove, would rather keep us in the single market. They won’t get a deal that cuts off all EU immigration. But if they got a deal that went some way towards restricting it, they might be willing to offer the voters a chance to say yes or no to it. The Brexit vote was indeed a case of buyers’ regret.Thankfully, whatever the shysters and pocketfillers do, well over half of England and Wales have had enough buyers’ regret to vote out overwhelmingly. In hindsight, the UK should have never joined the EEC, but it seemed like a good thing at the time.Indeed, it was a good thing for a great many people.Money for nothing is such rallying point for a certain kind of people.But the party was over a long time ago, for a lot of people.The people who insist on partying on do so clearly at the expense of the disenfranchised.That is one lesson the people on the gravy train are refusing to take on board, but take on board that lesson they will-they will learn the hard way.It was ever thus. less than 40% turned out to vote. just fractionally over half of those voted leave. indeed the whole thing was underwhelming. Why not have politicians cast aside party loyalty in favour of putting the country first and realigning themselves in relation to what they want for Britain for the future? A bit like they have to do when the country is at risk in a war. Heaven knows the country and the future is definitely at considerable risk! Boris and Brexit politicians of all persuasions could then stand in a general election. BUT the manifestos of each party standing must be crystal clear and binding as far as economic circumstances will allow. If politicians could put aside self interest long enough to declare with passion what they really want for Britain’s future we could vote with confidence and set out to help achieve a better future for our children. Rich, That works both ways. Those that voted on the basis of inertia or for status quo may well now feel that they should have had the courage to vote out. Jim Farr you do realise that sticking your fingers in your ears and reciting the mantra “What’s done is done” simply doesn’t actually make it so? You do? Ah, OK, I think I see where the problem lies….. I fear Jim Farr is right. The constitutional convention by now is that the popular will prevails. Look at the Scottish referendum. The ‘vow’ made by the major parties had to be kept. There would be a popular uprising if supercilious politicians decided to dish the majority of voters. There won’t be a second referendum. As to terms of negotiations, exiting via Article 50 is not the only way out. Article 165 of the 1969 Vienna Agreement on the Law of Treaties could be used to leave in three months. I have suggested this to the Leave campaign. Again the 1972 European Communities Act could simply be repealed by Parliament. As to the single market, the fetish surrounding it is overblown. All sorts of other countries do better trade with the EU than we do from outside it by paying a small tariff. Ideally a free trade treaty abolishing all tariffs would be in the best interest of both sides. The U.K. would also abolish the EU external tariffs to gain cheaper food and other cheaper imports. The alternative to being inside the EU is to be outside it like most of the world which grows faster. The EU meanwhile should want to reach a fair, friendly and quick agreement with the U.K. since it will have to stave off huge internal disagreements and calls for more referendums. If there is to be a second referendum it won’t be in Britain but in another EU member state. It is not the UK that faces dissolution but the EU. Oh, Sked. Aren’t you the one who laid the foundation for the racist and xenophobic UKIP? Why schould we take you serious. so in other words, you want to cherry-pick the bits that suit but not share in the bits that don’t. Paul- I just watched a mini documentary set in Bolton, and a lot of the Leave voters seemed to be under the impression that they were voting to preserve the National Health service, or to keep out refugees. Does ‘confused by lies and fear’ count in the same way as ‘drunk’… ? How to sober them up after years of grinding abuse and austerity is another question. I am sceptical that Boris Johnson wants to run for PM and possibly go to the country fir an election, then renegotiate. I think this was planned, he has misdirected the electorate, as he originally wanted to stay, and I think he still does. Congratulations to the brave people of Great Britain who rejected the elite of Brussels who have zero immigrants in their lives but force millions of them on the lower classes. Just seeing the weeping liberal sore loser renain comments made my whole year. I lived in Whitby for 5 years so spare me your lane insults I am celebrating your Independence Day. Sore LOSERS!! The remain sore losers are embarrassing themselves. Remember the UK citizens were never given the vote to join the EU in the first place. I have no doubt that there will be attempts by the elites and left in the UK to ignore this vote and to make sure they stay in the EU. And there removing names from that petition because of fraudulent names, 77 thousand have been removed so far. Whether Jim Farr is right or wrong, the key message from the vote is that we live in a disunited kingdom which will now in effect fall apart. Those who voted for brexit have exercised their democratic mandate for a far greater degree of control over their national borders, The fact that there are likely to be more borders to patrol and less co-operation with those on the other side of them will presumably be a source of great comfort as we all take to the appointed lifeboats. There are plenty of examples of nation states falling apart – unfortunately none of those seem to be very amicable or to the economic benefit or real security of those involved. A very dark day for Great Britain, although it will be refreshing to at least have the opportunity for the euro sceptics to be able to show us just how much the dead hand of Europe and all those pesky immigrants who were clearly displacing the enfranchised have been holding little England back. Go for it guys – I am breathless with enthusiasm to see just how much of the promised dividend is realised and whether in 5 to 10 years time we will be more concerned with a diaspora of the young and talented than with unreasonable fear that jonny foreigner is, in fact, an implacable enemy – only interested in stealing a place in front of us in A&E. its not a popularity contest. what do ou fear so much in the question going to the people a second time? You can’t have annual referendums. They are once in a generation decisions. R. Mac seems to be just a bad loser. Clearly there are lots of them about. Congratulations – it would appear that you have achieved great things in your own opinion. I sincerely hope that your vision of a UK ‘freed’ from Europe lives up to your expectation, and the fact that it has been won the basis of a deceitful campaign that pandered to the worst rather than the best in what was our country does not bother you. If however what is in fact achieved is the Balkanization of Great Britain rest assured that a very large proportion of the country will indeed be as you say ‘bad losers’, including many of those who voted based upon jingoistic and unsustainable falsehoods and who will have to reap the whirlwind arising from the seeds they have sown. . I wonder if you are one of them – or whether you are with the crew who believed that the ends justified the means? Its good to see that the majority didn’t buy in to the scaremongering “project fear” the remainers peddled for months. I believe that many voted to remain based on fear of economic devastation, and would have voted leave if they knew that it wasn’t the case. Remember that when Sweden had a Euro referendum in 2003 they had all the experts, EU, IMF, economists, Nobel prize winners etc predicting an economic wasteland if Sweden dared to reject the Euro. And popular pro-Euro politician Anna Lindh was murdered less than a week before the referendum. Sweden of course voted to reject the Euro, and has turned out to be better off for it, despite the scaremongering of the international elites and the highly educated experts. The UK too was told during the 1990s they would miss out on an economic paradise if they failed to join the Euro. I can even remember continental politicians mocking the UK for consciously choosing to remain out and that they (the continentals) would reap the benefits from it. Again, many experts peddled the Euro and begged the Major and Blair governments to join. And guess what happened, the UK didn’t join and was better off for it. So will it be this time, after speculators and rich bankers have thrown their little temper tantrum. Back in 2005, we in the Netherlands were told by the European Commission (Margot Wallstroem) that if we dared to reject the EU Constitution it would lead to war. She made an emotional speech at the site of the old Nazi concentration camp Theresienstadt (Terezin) making this very claim. No war in Europe happened. The pattern is clear. The pro-EU side, IMF, World Bank, experts, economists always seem to send out dire warnings of war and/or economic wasteland if the voters don’t back what they the elites want. And it never does happen. The track record of these dire warnings isn’t very good at all. And it gets worse when you realize that none of them saw the economic crash of 2008 coming. Alan , you are the loser !!! Will shall see in the end who is going to do the work that the immigrants are doing ? No brit will go work the low paid jobs , they prefer to stay home and get benefits! Who will pay for their benefits then ??? The least of this country’s problems is immigration, at least from Europe. Educate yourself on the facts! Calling someone a bad loser doesn’t help much, Alan. And if you’re aware enough to spot that fault you should probably have the good grace to ease up on pointing it out. What would be far more elevating is if you told us exactly what you’d like to see the government do to bring people together and build a consensus for a new post-EU settlement. As you and others keep reminding the 16 million who voted for something different, they lost. So to the winners come the spoils. As such, I think this blog post raises some important initial points – and jabbing away with the ‘sore loser’ tag hardly helps to further what is already a fractious and acrimonious debate. So please use your fingers for something more productive than chipping away at those who are quite understandably upset. We are all, after all, in the same boat. Wait, wait, this is either brexit, bremain or get out of the way. There is only one adjective that separates us then matey. Sign the petition for a second referendum. 1,277,999 signatures collected so far! Sign rate over 1,000/minute right now! I have to agree with you however that the only way for this to succeed (a word that in all other contexts has no right to be used in these circumstances) is if the Brexit campaign now does not falter and pushes through quickly. Happily unlike you I can foresee no circumstances in which that is anything other than a pipe dream held by the most zealous brexiteers. As the full consequences of what is likely to happen unfold on the british people I think you will have to face many more searching questions about just what life in a ‘free’ britain (which will in all probability no longer exist as a single state) will be like and whether there will be any appreciable impact on net immigration at all – other than that caused by emigration of those who no longer feel welcome or comfortable here. You pulled the pin and characterise me as a bad loser because I don’t like getting blown up – you are of course correct. But only time will tell who the biggest losers are likely to be. As the rolling stones said ‘you can’t always get what you want’ you have tried now but whether you will ‘get what you need’ is highly questionable. The uncertainty as to which parts of the UK they have a mandate from. The fact that ‘mistakes’ were made in representing the consequences of brexit. To be frank I see no difficulties there at all that could not be solved by a bit of legal skullduggery or perhaps a bit of martial law – whether what is left afterwards is worth it I will leave to your judgement. That whole scenario was played out in europe many times in the last century I hope for the sake of my children that we are not now set for a re-enactment. I write as a constituent who is very disappointed by the vote for Brexit. I believe strongly that this is a time for all pro-EU MPs to immediately put aside party and personal differences. I want to suggest that pro-EU MPs across all parties unite to dissolve the current parliament, and then form an electoral pact so that there is only one strong, pro-EU candidate for each seat at the subsequent General Election. The Brexit campaign could do likewise. If legally necessary, there should also be a vote to amend current legislation relating to fixed-term parliaments, and thereby enable a snap election to take place. This would, of course, be seen as a second referendum in all but name. However, I believe that this is a necessary step in our current, unusual circumstances; I say this not just because of the huge consequences of leaving the EU (which are dawning on more and more people), but also because a huge majority of current MPs are pro-EU, and cannot be expected to have the appetite for the task of Brexit anyway. Steering through Brexit will be a mammoth job which would require MPs and ministers to take a whole range of decisions on our behalf over many years, as is the norm in a representative democracy. It would not make sense for pro-EU MPs to undertake this task, especially in the absence of a clear mandate for the implementation of a specific Brexit manifesto. In this respect, this referendum campaign was significantly different from, and less conclusive than, the 2014 Scottish referendum and General Elections. In this further, and hopefully definitive election, it would make sense for all pro-EU candidates to be clear in their belief that they commit, and that the nation should commit, to the EU, warts and all. In any event, I wish you the best in these turbulent times, and thank you for your hard work on our behalf. Sorry, I posted my previous comment twice. I agree fully with you. I started this campaign as a Eurosceptic but, as I waited for the Brexit manifesto to be hammered out, it dawned on me gradually that a serious drive for a positive Brexit should have started at least 20 years ago. The lack of unity, cynicism, xenophobia, populist rabble-rousing, and political amateurism left me convinced that there was only remotely credible vision for this nation, which has been made in Brussels, and which we should feel lucky to have had a part in, given the immature way the UK has dealt with European allies for so long. There has been no positive home-grown vision for our nation since 1945. We won’t accept this as a nation until we hit the skids, which is now happening. Since when is a majority not real? I’m finding it bizarre for the Remain voters to sort of ‘not like’ the result and consequently say there were all sorts of reasons for it being ‘wrong’. More people voted for Brexit than Remain. It may be there could be some sort of ‘Buyers Regret’ for some, but the converse it true also. A ‘win’ for Remain ‘might’ have caused for many to feel they had made a mistake. Or is that so out of line with your belief system that you cannot appreciate that. Finally, if those who vote Leave did so without knowing what they were voting for, whose fault is that? British (and European) politics comes out very badly from this, but what do they care, they have rarely taken any accountability for their actions anyway. A fair vote was held and the outcome was leave. Obviously this won’t please everyone but I would just say instead of name calling all the leave voters and trying to get the outcome reversed as it didn’t suit you put your energy into making this work. Yes there will be a period of upheaval but I am confident things will settle. Dry your eyes and move on remain voters! Alan , the worst is yet to come! Excuse me? NO, the rest of Europeans won’t suffer the consequences of such uncertainty. Voting is an act of responsibility. So LEAVE, means LEAVE, period. No more negotiations, no more chances, no more parasitism. The debate is far from over. A referendum is not legally binding (check out stuff on the BBC news website). The Scottish referendum was different they voted to stay and not change anything which is why the leave campaign had to accept the majority vote. In the article, the author states that DC broke a promise when he resigned yesterday. In fact he declared early on during the campaign that he would tender his resignation on June 24th if the Leave campaign won. Today, we are still members of the EU, there is a long way to go before we leave, if we do. Alan, the Remainers might be bad losers however, at least they are not dreaming up conspiracy therories as to why the majority voted to leave. Reply to Emma. Your naive faith in the BBC is touching but very misplaced. Referendums do trump general elections. They only happen when Parliament decides a question is so big that the voters–not Parliament–must decide. Their verdicts are never overturned. On issues as basic as sovereignty they are the correct instrument to use. Parliament itself cannot decide whether a people should be ruled by others. And Parliament has acknowledged this in two EU and one Scottish referendum. Devolution was also legitimised in this way. So the referendum verdict will be upheld. If it is not Parliament far from asserting its sovereignty will deservedly forfeit the loyalty of the sovereign people with consequences I hate to imagine. As for conspiracy theories, Remain is full of them, principally that the vote was won by lies, racism and ignorance. It has what I have called a new stab-in-the-back legend blaming the workers rather than the Jews. The result is a nascent Remain fascism working for the overthrow of a majority vote. You need to think very carefully before boosting it. ‘Afterwards Squealer was sent round the farm to explain the new arrangement to the others. The Leave campaign won by never offering a coherent policy on anything except exit. The half of the electorate who voted remain were clear what they wanted – to remain in, and reform the EU in some way. The Leavers, on the other hand split into two diametrically opposed groups. On one side, were those who passionately want more protection for our industries, improved public services and reduction/a ban on immigration; and on the other side people who want an unfettered free market, with a bonfire of regulations (including protections for workers, consumers and human rights), and who have explicitly said they are in favour of immigration (Gove and Johnson). These two are opposites. When a new Government emerges, it will be obliged to come off the fence, at which point one or other of these groups will be surprised, disappointed and angry, and many of them will wish they had joined the remainers. A general election before the expiry of the 2 year Article 50 period, could easily elect a “return” Government. Considering that countries are now queuing to trade with Britain and Junkers has turned round and said you must leave as soon as possible. I think this whole conversation is rubbish. there has been no Armageddon, no world war 3 or being blown up as the poster above describes. Things are moving along quite nicely. Contrary to popular belief there are no sovereign states inside the UK, it is the sovereign state. So for once in your lives, live with democracy and let’s get on with it. Remain lost. Accept the result and impliment it instead of fabricating reasons not to do so. I only wonder if EU can afford and will allow UK all this time to make up their mind this way?! Can UK’s voting and veto rights be suspended until it makes up it’s mind? There are provisions limiting these rights in Article 50, so logically, it is in EU’s interest to get UK to trigger Article 50 asap. If UK can hold EU ransom this way – Cameron and Johnson’s crime is much greater than Brexit alone! We should not underestimate the anti-EU feeling in other EU countries. A Dutch colleague tells me that a recent survey revealed that 53% of the Dutch would vote out if they had the chance; a recent poll in France puts ‘leave’ on 60%. There is simmering discontent in Sweden and Spain. There is poisonous rancour against Germany in Greece. The Dutch and the French have a difficult relationship etc. etc. I actually voted remain, hoping that a narrow win for remain would be a shot across the EU’s bows, a frightener to curtail its meddlesome incompetence. But Juncker is pressing for the UK to be ‘punished’ to deter others from leaving. Punishing the UK might have that effect on them, but they are unlikely to regard the EU positively in that case. If a reformed EU is not a possibility, implosion is. Just get over it! Democracy has prevailed and vote leave won. I am shocked at the ‘pro remain’ sore loser attitude. There will not be another referendum and you have 2 choices. 1) Pack your bags and go live elsewhere. 2) Accept the decision and adopt my ‘believe and Britain WILL achieve’ attitude. Well theres 8000 jobs at Nissan in sunderland will be going as the subsidies that they get in the euro zone will be stopped, not to mention the knock on effect of the 30.000 people they employ in the UK. Bank of America are moving 2000 jobs to Luxembourg. So all in all it’s a result all round and the immigrant’s wont be taking any jobs because there will be none to take. Why is it that people cannot accept that millions of people have voted and a majority have voted leave. There is a view held among a huge segment of the population that their destiny is in the hands of the ‘establishment’ run by the ‘ elite few’. Asking for a new referendum simply reinforces the view that elections willed be called and referenda held until ‘ the elite’ have their way. The failure of the popular vote will unleash forces far worse than the economic disruption caused by brexit. Fun discussion. Looks to me like people here are confusing politics with a board game. The difference between politics and a board game is that in a boardgame the rules are given. In politics they are not. Anecdotal buyers remorse is probably not sufficient justification for a rerun, but the explicit statements by leading Brexiteers that they, essentially, lied in their campaign (no, the 350m/week is unlikely to go to the NHS, no, emigration is not likely to come down significantly, etc.) means that there are reasonable moral grounds for revisiting the decision through some constitutional device. I’ll be interested to see what happens over the next couple of weeks, and I think it is not actually in the interests of the rest of the EU to insist on the triggering of article 50 immediately. To have the UK come back with its tail between its legs would be a major coup. The Fixed Terms Parliament Act can be repealed by a simple 50% plus one vote. As someone looking in from Ireland I can confirm that there will indeed be a second referendum. Hi I did vote to leave and it was not because of imagration. I realise that we would have to strike trade deals and free movement would be apart of that. Also we need imagration to acquire the skills Britain is lacking. I would prefer a point system but realise I won’t happen. I voted because I feel that too many decisions are made for our country by people who don’t know our views. I would like more power to be given back to us and for us to decide what happens to the UK. Including the ability for us to decide and make our own laws for the Benifit of UK. If this was granted I would sign to remain str8 away. Also why should Scotland only get 30% of the fishing quoter of the fish that is caught off its own coast line. Surely that is wrong. The UK I think will be looked at over time as a steady choice for a lot of businesses. Especially if more unrest carries on throughout Europe and the feeling of uncertainty with the Euro grows. It’s a long game I’m thinking of not short term. I can do without nights out if I have to, if it give us a better future for our kids. I could be completely wrong tho. How ever I do recognise that many people do feel and have made clear. That they have been led astray by the comments and pledges by some of the leave campaign politicians. So much to the point that they say they would change their vote. If that is the case I would be happy with a second referendum ( I don’t think will happen) if that’s what the people of the UK want. Personally my vote would stay the same. I’ve said I would be happy paying an emergency tax over the next 3-5 years to give UK a stronger outlook/ position. I have one question. Why in previous elections has no one called for a new election because they didn’t like the result. Politicians lie, it’s their job, it’s how they get elected. Over 17 million people, the largest turnout ever in British history, voted out.? Nothing can be done until parliament repeals the European Communities Act 1972. Only then can Article 50 of the Lisbon Treaty be invoked to the effect that GB want to leave the EU. A referendum gives voice to the electorate but there are other legal processes that must be followed before we are out of the EU. if you are unhappy discuss with you MP as they can influence what happens next in parliament. So, what’s the plan for after we leave the EU guys? Guys? Where are you guys? Get over it and pull the country together. No one likes change, but we all make changes in our life and be brave as British people are and love your country and let’s move forward. Give the Brexit team a chance as the way it is going there will be a lot more countries leaving the eu. I agree with this article, which is in fact neutral about the issues in the referendum. This referendum was not like the Scottish Indy vote of 2014 or any general election because there was no Brexit manifesto which a Leave vote could mandate. It was just “leave” and then work out the details afterwards. The Leave campaign never grasped the nettle and hammered out a negotiating platform or agreed on a Brexit ministerial team in waiting. As the article points out, they never faced up to the trade-off between free trade and free movement of people. They suggested that we “could” have our cake and eat it because we are so powerful. They did this in order to cynically maximise their campaign advantage. So now MPs and ministers are left with a plethora of hard policy decisions to make, none of which yet have a mandate. I predict that the Brexit movement will try to continue to fudge real policy commitments with the idea of blaming an eventual poor deal on EU bullying. But over time, the Brexit movement will fracture more and more as pressure grows on them to be clear about policy, they themselves realise the mess they have put themselves in, and the economy worsens. We are seeing British politics at its worst. As usual a very metro view. Lots of country people (which does not equal stupid) want us to have a UK agricultural policy rather than an EU one based on the interests of highly subsidised and inefficient French farmers and German agri-green ideology. The French government held a referendum on Mastricht in the 70’s i believe. The vote result was then ignored by the President and negotiatilns went ahead. The French held a referendum on Mastricht in the 70’s. The result was then ignored by the then President and negotiatilns went ahead. British politics at its worst is all those Remainers who refuse to accept the result of a democratic referendum. We always said the EU was undemocratic. Its supporters seem no better. Pity the UK isn’t Ireland or Denmark which were forced into second referendums when necessary by their own undemocratic elites in alliance with the Commission. The peasants have revolted. Get used to it. Once a new cabinet is in place Brexit will take place quickly and smoothly. But Alan, the problem is that the Leave vote is an empty mandate, with no detail. If we assume that the Brexit campaign organise themselves into a government which Parliament gives its confidence to, it will then have to decide its platform for negotiations with the EU. As far as I can see, what Brexiteers and their supporters want is the same current full access to the single market with no corresponding obligation to accept free movement. What we know so far from EU leaders is that this will not be acceptable. So what is our fall-back position? Surely this was a reasonable thing for the voters to have known, going into the polling booth last Thursday? Why don’t we know this by now, Alan? You’re more expert on these matters than me. I await your answer. There is no room for ambiguity. No uncertainty. It might be the wrong decision, or it might not be, but a decision has been made. That was the only purpose of the referendum. Whether we like it or not, it cannot be undone and it must be respected. The point of Brexit was Brexit, not a general election.The government, which in fact oversaw this referendum and now has egg on its face because it refused to stay neutral and let people make up their minds on the basis of informed debate instead of the frankly ridiculous scare campaign, now has the job of dealing with the outcome.Cameron has spat out his dummy, so it is up to his successor or whoever will form the next government to deal with it.You want a fall-back position?That is the fall-back position.The Bremainders lost the vote, they lost the debate, now it looks like they will also lose the next election, for their answer to everything is the EU will provide, and their question to everything is that they are lost in a democracy the size and calibre of the UK.Never mind Scotland and N Ireland.Rump UK can do fine without them.Look at the money England has thrown at Northern Ireland since the beginning of the Troubles.Think of the difference Scotland within or without rump UK will make.Nowt! You never accepted previous mandates handed down by the electorate or stopped agitating for the cause you believe in. Why should those of us opposed to that view simply fall into line, rather than follow your example? That just wouldn’t be British. Democratic, perhaps, but certainly not truthful. The sheer dishonesty of some of the claims during the campaign was breathtaking, even for politicians. On the contrary, I always accepted the results of general elections and referendums. The last one on Europe was in 1975. Nobody suggested that the outcome was illegitimate. Today we are being told the day after Brexit’s victory that the result should not be recognised. David Lamy MP is saying Parliament should ignore it while Sturgeon who has now lost two referendums over the British question has threatened a veto ( unconstitutional and undemocratic) . Political argument is fine. By all means let that continue. But the pro-Europeans are now toying with more sinister and underhand expedients. Don’t dress up anti-democratic manoeuvres as the opposite. You are playing with fire. The referendum was called by a Pro-EU prime minister. He set the question ( modified for fairness by the Electoral Commission ) as Remain or Leave. It was not a general election. The Leave Campaign was a coalition of people who advised voters to vote Leave. It was not an official opposition with an alternative manifesto. You know that. What it said was not what you are saying. Gove said he did not want the UK to remain in the Single Market. Lawson pointed out that most states in the world were outside the EU and were nearly all doing economically better. Johnson pointed out that only Antarctica was doing worse as a continent. All knew negotiations would be needed but there was not even a commitment to trigger Article 50. There are other ways of exiting. So we are left to suppose–I have no inside information– that if freedom of movement is rejected–as taking back control implies– then the UK will simply seek to negotiate a free trade treaty but if necessary will just trade with the EU as the US, China and most states do under WTO rules. If you had been paying attention you could have worked this out for yourself. Meanwhile EU external tariffs will be dismantled to allow us to import cheaper food and goods from North America and Asia , EU red tape will be abolished on the 94% of companies not trading with the EU and £10 billion a year will be saved from EU membership costs. You could have worked this out too. Finally, until a new prime minister and cabinet are in place no government programme can be announced. You could have worked that out too. Meanwhile relax, watch Wimbledon and await your better future calmly over strawberries and cream washed down with a G and T.
Whatever happens now we are playing with fire. I would suggest deliberately and cynically lying to the electorate during the run up to such an important vote could also be described as sinister and underhand – although I accept that given the public standing of the political classes and the debate they engender, it could potentially be argued that expecting anything else (of either side) would be naive. Just what level such misrepresentation must reach before it might be identified as a corrupt practice and what the tests that would have to be applied to such evidence will be for others to judge. One thing is clear – today’s UK political environment is in flux – largely driven by the ‘clever’ positioning of referenda – One designed to separate labour from its heartland vote and the other to put a sticking plaster over internal schisms in the conservative party over Europe. The consequences of that cleverness are now coming home to roost in all sorts of unanticipated ways. The first referendum worked too well. The second has backfired so spectacularly that it has unleashed the equivalent of a neutron bomb – affecting the political calculations of everybody involved – even Mr Farage seems to grasp just how toxic what has now been unleashed will become. The situation is unprecedented and the risks are far higher than anyone anticipated – those that plunge onward might at some distant point in the future be seen as visionary leaders (and I’m afraid I cannot see anyone that fulfills those criteria from the current crop) but that is far from a foregone conclusion. I have just as critical a view of the arguments from Remain as you have of those from Leave. The difference between us is that I would have accepted the legitimacy of the verdict if it had gone the other way. You are still in denial. You are also rationalising steps that undermine democracy. But then the EU ‘ a sempre ragione’. The precedent is rather worrying. we can tell just by how much you are labouring your point that you are not a person who would accept. Hello to you all. I live in Cambridge. I voted for Remain as did Cambridge by a 3:1 majority. The fact is the senior people in the ‘Vote Leave’ campaign were quite clearly racist and so many of their arguments were inaccurate and misleading. There are no unelected MEPs, we have 832 unelected Lords.Another thing is that Gove, Johnson and Farage have admitted that their figures were wrong. The savings to the NHS, in a paper by medical researchers at Imperial College London, said the savings to the NHS from a Brexit would only be £22 million, which wouldn’t cover the NHS budget deficit. There is also the fact that now we have had the Brexit vote, we will have to trade with the 27 member states of the EU and will have no say over the rules. Finally NS has threatened to block Brexit and possibly Stormont will do the same. Exuse me!? I voted leave and I am under 40 I am most certainly NOT racist. My elderly parents voted Remain, and are not wrinkly little Englanders. Deal with the change before you without resorting to insults. Can I say that if both sides were transparent with facts then the common people would of been more understanding of the situation. We all know the £350m was a big fat lie and a more realistic figure is more like £160m after rebates. Why can’t someone tell us what we get for this ???? Simple language that we all understand as opposed to what will happen if we don’t vote for the right side. Would there be such an outcry if the Remainers had ONE vote to decide the outcome in their favour???? Would they accept another referendum if the Brexiteers weren’t satisfied??? If some people decided they couldn’t be bothered/ they wished to make a protest no show/ they were anxious about the outcome so did not take part/ thought that it would never happen……WHATEVER the reason for not voting and it being so close, the democratic process of a referendum to decide the fate of the country belonging to the European Union HAS BEEN DECIDED. If only these protestors would use that energy to getting along with change. i welcome whole heartedly a second opinion on such a crucial matter. Unfortunately the majority of those who have voted to leave have been gripped by the politics and division, for which there must remain no place in 21st century Britain. I wonder if there ought to be legal proceedings against those who ran the false aspects of the Leave campaign. Two thirds of MPs ought to put country way before party and demand a general election in the next few weeks, before Article 50 is triggered. If they were honourable they would do so. They could then campaign on a single issue – remain in the EU – and let the 48% vote for them along with all those who now see the folly of their vote to leave. Such an election would override the referendum. I don’t understand the optimism of the Leavers on here. It’s so far from the current reality. China expressed its concerns about its impact today. For a country apparently serious about going “out into the world”, we have prepared for it spectacularly badly. Yet we have this invincible hubris that somehow countries will be tripping over themselves to offer us favourable bilateral trade deals. Racist insults now rising on the streets. This campaign has stirred a kraken. I keep reading that the UK will return back into the fold of the commonwealth. Im in that commonwealth, in NZ. We left you in the 70’s when first you left in favour of the EEC. We have new markets, new friends, and have no appetite to be back inside anyone’s fold. I still listn to all the scaremongers from the journalists, newsrooms and the people who can make an influence in the changes that they may not like but they have to accept. If we are not careful we will damage our great country beyond repair. Some may say this has happened others may not but we need to galvanise and keep our good people to run the country. Let’s get together and make this happen as I am getting fed up with the negatativity of this and we have not even left yet. To all the negative responses above, I have never read so much rubbish!. There will not be another referendum vote. Get over it!!!!! Stop acting like petulant children. This is coming from someone who voted remain. Get behind the country, stop throwing your toys out the pram. What’s done is done, the majority have spoken and have one this vote. this is a democracy after all, that means the higher vote wins, in case you didn’t get it !!! !’, be patient it’s only been 3 days for goodness sake, just calm down and give it a chance and then you can watch this country grow into something great, which it will do, once everyone pulls together to show the world we are united. You are all getting very boring by keep banging on about this, just grow up and accept it!!!! I feel embarrassed to be associated with the remain group, you all seem to want a dictatorship not a democracy. Calm down and give us all a break. YOU ARE BORING!!!! I’m beginning to think if you achieved another vote I’d vote Brexit, you have convinced me, so keep up the good work, you may help Brexit achieve 20 million next time ha ha. a petulant child would be one who resorts to over use of English grammatical marks to try to make their point …..???? !!!! The government whoever it maybe, actually needs Freedom of movement, growing our population has been how we have managed to stay out of recession since the last financial crisis. With an ageing population indigenous growth in the workforce is simply not enough. Poor Remainers. . Their world has collapsed and they cannot accept the democratic decision of the people. They find sustenance by calling opponents racist and quoting their own skewered sets of statistics. Get real. If Remain had won and Brexiteers had objected to the outcome they would have been pushed aside and the Remain camp would have insisted on the referendum verdict being final. I have no more time to waste on the childish whining and whinging of these sneering, fair weather democrats. They should grow up and accept they lost. God knows, we had to put up with membership of their corrupt, undemocratic, economically devastated, crappy wannabe superstate for decades. Actually, Alan on so low a voter turnout, with so close a result, if there had been the reverse, and it was followed by a cry if dismay I’d be happy to go back for a 2nd opinion. PS: and those of use who are Uk citizens living outside of mainland UK who didn’t get to vote, get a vote. After all, we are the ones probably most affected by the exit. For me, the answer to this debacle is an immediate GE. There is a mandate only to Leave, and not for any combination of the huge variety and number of policy choices which will have to be made in order to implement a Brexit. The current Parliament is pro-EU, so the voters should have the right to elect MPs who will take forward more specific Brexit policy choices based on manifesto commitments. Of course, if the voters vote for a majority of MPs who have made a manifesto commitment to ignore the referendum result, then the latter is dead in the water. Then democracy will have prevailed, and we can try to recover from this madness. Is it my imagination or have Bremainers only now woken up?There appears to be sour grapes a-plenty from the losers.One reason I can think of, the EU philes have yet to understand the position Europe is in, in the world and as a collection of nation-states which are subjected to an experiment in neo-feudal rule under the auspices of international high-finance and the transnational corporates.It is fine for people to ignore it.They will not be able to ignore it indefinitely.Another thing, the alienation many people have felt in our modern democratic liberal so-called free enterprise society is not only due to federalising globalists, but if people concentrate upon the EU for the moment, and its inexorable internalities which have no way of being resolved and which can only get worse as this project is forced along, then the people have their priorities right. First taxkle the biggest and most important obstacle.The position of Brexiters is also not understood by Bremainders, whereas the other way around, I think, Brexiters understand Bremainders very well, by and large. The onus is on Bremainders to get to grips with the political and economic factors which have made a groundswell of discontent in the EU translate into Brexit.There are many people in the EU who as yet support this project.They are unaware of the fact that within five years many of them will turn against it.This is due to the scientific facts of who is aware of what.People who know certain facts cannot unknow them.They moght forget, but when economic and political factors weigh more heavily as time goes on, that is not an option until far into dotage, by which time their awareness of their situation will have spread and deepened. Anyway, it cannot be but that many people miss out on the gravy train kept on the road with QE and gratuitous spending to buy support for the EU project.Many so advantaged naturally ascribe their good fortune to their own efforts, since they have been made to study, work(in a fashion) and go through some hoops to get where they are.Judging by the surfeit of professional, in more than one respect sometimes, and academic writers voicing an opinion, expert or otherwise, on politics, economics, finance, etc., it does not long to work out that we have an army of people somehow getting paid for a living, some of whom do fine analyses and many who are writing in support of a status quo which they are desperate to support simply because their living depends on it.The western democracies have long had more academics, economists and other assorted experts than what it sensibly knows what to do with.They are being looked after, somehow, by others who perform productive work.It might be assumed that experts who support the status quo also do productive work.However, if that support flies in the face of certain basic facts, parameters and the vagaries of human nature, which are sometimes exposed as slavishness and sometimes have rebellion as an overriding factor pushing events, then sooner or later the experts start getting it wrong. And another thing.Those in power in the worldly sense, whether it be spiritual/religious or material/political, they never give up volutarily.Generally, they would sooner all hell broke loose and all came crashing down than give up the power they have acquired.That is humanity.It has been known for ages.Bremainders have some catching up to do. 2% is hardly a ‘groundswell’ especially when its only 2% of 37.8% who voted. I disagree. For better or worse, according to one’s point of view, the debate on whether we remain or leave is over and now it is up to the government to negotiate the terms on which we leave. My advice for remainers is to argue their preferences for these terms rather than seeking to overturn the decision of the British people made on the largest turnout since 1992. Rob: 4 of the major partners have stated clearly their terms. Out is out. There is no picking the best bits and discarding the bits you don’t like. There is no negotiation about it. The only choice the govt has left to it is to call 50 or not. And that is now a debate that the sitting govt and MP’s will be considering. Good points – tell me – are you really from the planet Zog? Or is it just that you are now so far into your dotage that you just like a good wind up after a few too many G&Ts on a Sunday night? In the same line of reasoning and using the ‘Evil Empire’ theme you so ably describe (at length). You can’t kid me – it is really about the fact that the Germans want us to leave because with their aging population they are desperate to attract young fit and highly motivated refugees to their economy so they can keep the lights on and the factories churning out Beemers as the oldsters recline in peaceful bliss. In the meantime their secret agents have succeeded in invading Britain and making the crotchety old gits there massively fearful that the influx of immigrants attracted into their economy will in fact only be there to jump the queue in the NHS or to claim in work benefits while making no contribution to the economy at all (erm other than actually working in the NHS of course, or in other areas where they might produce stuff and pay taxes – you know – that sort of thing). With any luck the poor sods will throw themselves into the path of a pratfall of political clowns and academics who all believe in an ideal world outside of the EU and really resent having to co-operate with anyone – even each other – to the extent that they have not even come up with a coherent or shared vision of “Life after Leave” – not in scope apparently. As an added bonus it’s highly likely that this strategy will also result in the UK shaking itself to pieces – at which point my little sith padawan, your victory will be complete. Has anyone ever truly understood you? Mac Mac, you’ve got me flummoxed.My troll alarm is going berserk, but my intuition is telling me you are unemployed.I will google planet Zog, but I never heard of it.Me looking like an academic, you from a village? 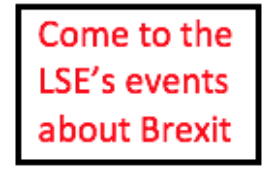 Dunno, the LSE is into serious stuff, not fiction as you like it.So, the reading is nothing, it is the understanding which matters.Do you need more clues? The vote was democratic the vote to leave won and Britain will be strong again independent same as Iceland who jailed the banksters gangsters and maybe Britain will need to do the same. I’m afraid I’ve been having a little bit of fun. Your troll alarm, is unfortunately wrong, never been unemployed and am in my fifties having left school in Scotland just after the winter of discontent, and went directly into employment at age 17. Currently run a small IT business which I founded three decades ago in the South East which, together with my personal contributions, means I have during my working career generated in excess of £50M in tax revenues for HMG, over 20% of which has been on the basis of work undertaken elsewhere in the EU and in global export markets. The original premise of debate here was “The Brexit debate is far from over: there will have to be a further vote”. One – an allegation of corrupt practice can be raised and it can be proven to the satisfaction of those judging the charge that it is sustainable and could credibly be proven to have resulted in a false ballot. I believe that while this may happen it is highly unlikely to be provable. Two – That the consequences of Brexit – once we are in full possession of the detailed economic plans and timetable for Brexit has such a dramatic impact upon the British People and the Nation State currently constituted as the United Kingdom that it is apparent that a further mandate is required to allow for Brexit of all or part of the UK to proceed. To be clear the second vote will not ask the same questions as the one we have just had answered by the country. Which result I personally accept – notwithstanding the dire consequences that trying to implement it without a reasonable national consensus on the actual plan to implement it which has not – in my view at least, either been considered or been achieved within the population at large. The coming days will see whether this view is in fact the one that prevails or whether the narrow implementation of a long held economic goal can be railroaded through despite significant misgivings in the majority of people – regardless of whether they voted for remain or leave. As a matter of interest I have encountered many mythic UK Governmental initiatives which in my opinion and repeated attempt to access do not actually exist – the Small Firms Loan Guarantee Scheme under Labour and The Conservatives is one such, but as yet I have never encountered any Brussels ‘Red Tape’ that has had the slightest negative consequence for our business either here or abroad. I do however understand your point about academics – whose main objective sometimes seems to be to identify ‘Gravy Trains’ not so much to decry, but to climb aboard. Brexit has a mandate – but it is not a blank cheque. Yes Mac, fine, but…, why is there a need for another vote?When the UK voted to stay in, by a bigger margin, to be sure, was there another vote after the future of the EEC now EU was made public?The referendum, as I said earlier, was a vote on Brexit.The people decided to Brexit, the English decided overwhelmingly to Brexit.Now you, or some group of persons, is asking for a plan or some guarantee.If the plan looks good, well, let’s have another vote.If the plan does not look good, well, no need for another vote, the govment will simply disregard the result of the referendum, like the EU Commissars ignore results from referendums which does not suit them, or they make the people vote again after browbeating them for a year.I think we can agree that the people who wanted Brexit had decided they wanted no more of this kind of autocratic technocratic absolutist rule.That was the point of the vote.Now you or some persons are suggesting the government of the UK should take over where the EU Commissars were given their marching orders by the British people, or peoples as Brendan O’Leary would have it, who is comparing chalk with cheese, confusing the two unions in the UK with the UK and its EU membership.Anyway, all is fair in love and war, as they say.Politics is war by all and any means.Politics will go on. Probably the worst article I have read since the Referendum. Leave won the Referendum, we are Leaving the EU, get over it. There will be no going back and no second Referendum. The Conservative Party will not split, trade will flourish, and Project Fear will be seen to be the lies that they were. The Labour Party might well split. Ukip will flourish. Brexit was the greatest victory for the British people since forever! The last time the UK voted on EU membership not only was the margin for ‘yes’ far larger across the country (67.2%) – there were only two areas (Shetland and the Western Isles) that actually had a majority ‘no’ vote. It is easy to see why Alan had no difficulty in accepting that result gracefully. One of the most corrosive aspects of this referendum’s result is that in very large and important parts of the country (whole countries, regions and most major cities) there is a majority for remain. Although I appreciate that under the rules of democracy we all abide that the value of each person’s vote is equal the current result cannot be described as anything other than a poisonous one which also opens up fault lines between the old (brexit) the young (remain) the more educated (remain) and the less well off, disaffected and economically abandoned (brexit). In short there is no ‘overwhelming’ majority as there was in 1975, and our more advanced analytics just highlights the multiple fault lines in our society, crystallised by a single issue perhaps but in reality arising from many factors. Who really knows? I do however disagree that the events in 1992 or 1993 in Denmark (or TBF anywhere else in Europe with regard to Maastricht) would carry much relevance or resonance with them. If this underlying motive is really what was driving them, it is far more likely that they were using the referendum as a proxy protest vote at the complete absence of any sort of effective regional economic development plan that applied to them or communicated the message that anyone in government in the UK (or in the more prosperous parts) gives a stuff about them. This failure is nothing to do with Europe, but can and should be squarely laid at the door of the UK Government. Alan is correct in his analysis that what we have now is dangerous for democracy, because it potentially pits the disenfranchised against the economically active and entitled, The old against the young, cities against the countryside and the Scots against the English. It is almost impossible to imagine a more divisive outcome, which in the end will really be little to do with Europe, despite the earnest hopes of some, and the battlecry for brexit. our voice should have been heard. Was it a proxy for a protest?I doubt it, Mac.Is it dangerous for democracy?The EU most certainly is dangerous for democracy.The establishment parties in rump UK are also dangerous for democracy.The groundswell against the status quo is imo only the beginning.Would you say that Bernard Connolly is uneducated and disadvantaged?What is happening re Brexit cannot be isolated from socalled populist trends elsewhere in the West.Where it leads, who knows, but I envisage a long struggle.It is much like the dynamics in a family with abusive relationships.Once the abused starts to struggle, they have already decided to get out of it come hell or high water.I know from experience, and from reading about it.A lot of women in the West are still struggling with it.Once one understands, the similarities with the EU clique and the disenfranchised as family dynamics becomes patently obvious. Alan Sked was happy to say that if the outcome had been in favour of Bremain, he would have accepted it.Most of the Brexiters would not in my estimation.The undercurrent feeding anti-EU feeling is quite different from the pro-EU contingent.The former is active and growing due to a greater awareness and straitened circumstances, the latter are saying ” I’m alright, Jack”, and defending an increasingly untenable position. Neo-feudal rule will not be pretty.Other than replace half the electorates with desperates from failed states in the third world, the Establishment of whatever political sheen has no plan for the politically disenfranchised in the EU.Voting as a majority is not going to help them either.Just imagine if UKip were to gain the most votes in the next general election.Would the reault be honoured by the incumbents?Let’s see what happens next. With a total uk population of 64 m only 27% voted to leave EU. Even on an electorate of 46 m only 38% voted to leave the EU. This is NOT a mandate for financial and political disaster!!! The vote was against the inequality in our country not against our continued membership of EU. OUR POLITICIANS MUST STAND TALL AND REFUSE TO INITATE OUR DEPARTURE. But given your logic they themselves would have no democratic mandate to oppose. The Remainers attempt to delegitimise the referendum result is interesting on many fronts, but the complaints over the relative slimness of the majority are particularly so. The second reading of the 1972 European Communities Bill was secured with a majority in the H of C of eight, so if just five MPs had voted the other way it would not have been secured. The five most marginal Tory constituencies at the 1970 election had a combined majority of just 331 – so, you could argue, entry into the EU was secured on the votes of 166 people. In any event, a massive constitutional change was achieved with the slimmest possible margin. There was never a popular buy-in and this has festered for 43 years. The REAL question is the long term one, which system do you want to end up in? An EU Superstate where no important decisions are taken at Westminster any more and your vote becomes worthless as one of 500m, or where decisions are all taken at Westminster. The question U.S. if we were not already in the EU would we seriously seeking to join it???? You are right Debbie. I cannot understand those who see the EU as a land of milk and honey. The introduction of the euro has devastated its economy and society and undermined its political stability. It has no solutions to its major problems and lacks any real influence internationally. It now seems to want to create a European army and to expand its territory by accelerated membership talks with Turkey. In short it is an economic and political mess which could implode at any time. Yet even on this blog there are submissions from naifs who view it a a sort of Fairyland. These are purblind European nationalists. Hi Alan, no I just dint get it. Whilst I would describe Remain voters in those terms I really don’t understand the attraction. You might enjoy watching on BBC iPlayer the Andrew Neil Sunday Politics (London) Programme BBC1 shown on 10/7/16. About half way through one of the guests reported that the official Remain campaign team tried to identify five reasons to stay in the EU but couldn’t find one! They also had no answer to the question of uncontrolled immigration. That’s why their campaign focussed exclusively on the negative impact of Leaving on the economy. You really have to ask yourself the Q if the official Leave campaign couldn’t think if a one good reason to stay in that would be attractive to the electorate then there probably isn’t one!!! In my view the EU is deeply undemocratic. It’s factually the case that there has been a slow and steathly transfer of power away from Westminster since we joined the EEC over 40 yrs ago. This has gone WAY, WAY beyond the mandate they have ever had from the electorate. Voting to Remain is voting to continue with this trend, and if we have on,y been asked once in 40+ years (and that only with a fight) then I’m not holding my breath to ever be asked again in my lifetime. This is our only chance to stop the continuing erosion of our own a government. It saddens me that do many people are just looking short term and have not observed the overall direction of travel over a 40+ year period. “Dr James Strong is a Fellow in Foreign Policy Analysis and International Relations at the London School of Economics and Political Science.” In other words, Dr James Strong has been radicalised by the establishment. Democracy is a dirty word unless it produces the result Dr Strong believes in. I voted to remain. Another refurendum and I’m OUT and I’m not the only one. Some things are more important than getting your own way. 1. It tells you that your views don’t matter. You would think if someone was going to change the content of your job or the street you live in they would consult you. The decision they have taken have much more far reaching effects than that, they now make our laws ….. but they didn’t ask you if they could do that. Don’t we also need to ask WHY they didnt want David Cameron to consult the British public through a referendum? 2. It also tells you the Direction of travel. From a common market of 6 or 8, to a political Union of 27 with no consultation with you, so where next? But you say that was all in the past and we are happy with it now. Ok …but will you be happy with it in the future? Go onto the EU Commission website and look at Appendix 1 of the 5 Presidents Report. (The 5 Presidents are the key leaders in the EU). This sets out plans to take over all the key financial institutions of Eurozone countries over the next 9 years (by 2025). They want to establish a Eurozone treasury. Well what does our Goverment treasury do? It I sets tax rates, borrows money, which affects businesses (and jobs) as well as deciding on the level of public service spending and so on. So a EU treasury is clearly going to want to function likewise. The EU also want to unify the central banking function …. for this read the role the Bank of England which sets interest rates for mortgages and savings and has a major role to play with high street banks. 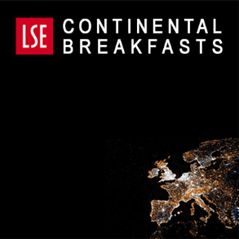 Ok we were not part of the Eurozone …. but my point is it tells you where this whole project is heading. Once these Treasury and Central Bank powers transfer away from your Government you have lost control over your economy. By the way this is not a conspiracy theory … these plans are published and freely available on the EU Commissions website. 3. The rules and decision making dynamics have changed. When we first joined we were able to stop by the power of Veto anything we did not agree with. That was an important safeguard. Now it works on a majority vote (I believe 55% of the number of states or if the states who agree represent 65% of the EU population). Did you know that according to EU official statistics since 2009 the UK has been more out voted on issues than any other nation except for Greece. In summary then we are part of a set up that can out vote us on the transfer of more powers away from our Parliament and who have made no commitment to ask YOU about that. You make not think much of Westminster but atleast it is in our country and you can go and protest outside of it, or Libby your MP. Do you even know who you MEP is? I didn’t. Did you know they cover a population roughly 10 times the diar of your MP? So if you have a complaint about how things are fine and fix iver it’s because the power has transferred to Brussels …. what chance do you think you have of being heard … assuming you can get to see your MEP that is. I don’t think this is about immigration, a single market or any other specific issue. I think this is about YOU!! YOU RIGHT TO BE HEARD and have a say in how things are run in the country you live in. I wonder how many Scottish voters who are so fierce about their independence realise the plans the EU have to diminish the powers of member states to the pint where they can no-longer claim to be managing their own affairs. Well put, and that is only the tip of the iceberg.As an aside, the Autralian Fin Review has an opinion piece telling its readers that the Senate (Federal) will not have much to do from now on.Increasingly, it is being let out that elected representatives are only stooges.How long have they been stooges in fact?It can not be credible to argue, under the circumstances, that even the Executive in government has much say on those issues which matter to the transnational corporations. Democracy in the West is not really all that well-established.There is a lesson here for everybody, if people wish to take notice and educate themselves. democracy in the west is just fine, however, your knowledge is showing some holes geographically. Sorry to break it to you but Australia isn’t in the EU. Just like the middle east and all them Muslims you probably hoped will now be evicted. I am a convinced Remainer, and it’s hard to see any silver lining at the moment. Nevertheless, I think the Remain camp need to be very careful about portraying all Leavers as Neanderthal racists, or just plain ignorant. The EU and its supporters have been in denial for far too long about the unpopularity of the institution – and above all its decision-making processes, which are difficult to defend even by those of us who favour staying in. If they had responded sensibly to the messages clearly sent in previous referendums eg in Denmark on Maastricht; Ireland on the Treaty of Nice; France and the Netherlands on the EU Constitution then perhaps we wouldn’t be where we are today. 17.5m people did not vote leave because they are all racists or stupid, or even just because of immigration, many of them voted that way because of a genuine dislike of the way business is conducted within the European Union. Also, the “we wuz robbed” refrain is ludicrous when the Remain side had every possible advantage (including money; the backing of all major businessmen, economists, statesmen, political parties, and the civil service; and, of course, the advantage of the status quo). Nor do I buy into the argument that somehow young people have been betrayed by a selfish older generation. Firstly, no one can possibly argue (or can have thought) that there would be short term gain in a Brexit vote, so those oldies who voted Leave did so because they thought it right for the long-term not for the short term. Secondly, only 35% of under 25-year-olds voted so they really have only themselves to blame. Of course there has been some ‘buyer’s remorse’, but when hasn’t there been? I can hardly think of a single election after which the winner’s popularity has not sunk, sometimes quickly and dramatically, but that doesn’t justify a re-run of every election a couple of months later. If I am right that a large part of the problem stems from ignoring the previous warning signals from Denmark, Ireland, France, and the Netherlands, then trying to reverse the 23 June result (which no doubt could be done) would just build up even more resentment for the future, and not just in the UK. Our best hope now is a very steady hand in Number 10; some very clever civil servants working on a compromise agreement; and a bit of goodwill from the EU…perhaps unlikely! Can remain voters please stop moaning.The EU is all about money not people.Did you not hear what they said after vote,pack your bags and leave.The people of the UK need to pull together and move on for the future of all our children.I voted leave,I am middle aged and have a degree in Sociology and Economics. UK will survive without the EU.Protesting is a quieter way of rioting.Bob Geldof and Tony Blair,who will come out of the woodwork next. The remain voters are really saying, “although there was a referendum, only the remain should vote”. So much for democracy! Good job the young men and women who went to war to make this country free did not refuse to go. Where would we be now? I think the referendum vote was decisive and should be accepted – as far as it goes. Once the Conservatives have a new leader he or she should as their first action seek Parliamentary approval to invoke Article 50. And all MPs – whether Leavers or Remainers – should support that. It is wrong to campaign either for a second referendum now when nothing has changed or for MPs to subvert the process. The people have spoken – Remainers like me lost – we need to accept the verdict. However, the Leave campaigners made inconsistent proposals for what should happen after Brexit. They made forecasts about how the EU would respond that seem unlikely to be realised. Some have scuttled away. There was no plan. So there can be no mandate for actual Brexit. The central dilemma of Brexit planning is that we either have full membership of the single market and accept freedom of movement; or we control immigration and therefore trade into Europe from outside and accept that we also do not have free movement into the EU. Some Brexit campaigners acknowledged that dilemma. They were happy to be outside, and forecast a glorious economic and social future – although the weight of experts was against them. But others said that the EU would give us a relationship on our terms. Or used misleading terminology such as “access to” the single market to cover a fudge. There are a million details to sort out and that will take years. But when the new government negotiates with the EU it should be possible quickly to resolve that central question: Membership of the Single Market or not. We should then have the real Brexit referendum, when the terms of Brexit are clear. Having a single worked up proposal would change everything. It would not be a re-run of the June vote. Some voters – both Leave and Remain – would wish to change their mind; others will vote the same way. All of us should have the chance to choose between two fully worked up proposals. And there is another reason why people will wish to have another chance. It is not only Remain voters who are horrified by the turn the country has taken. There were lots of reasons why people voted Leave. I am sure that many Leave voters are as appalled as I am by the rise in hate attacks. OK, that is the work of criminals. But ought we not to be equally horrified by front runner Theresa May’s willingness even to consider the forced deportation of EU citizens who are living lawfully in the UK? That is what it means when she refuses to guarantee them continued rights of residence. We need to be clear that it is the referendum result that has validated that sort of nasty behaviour. And those who voted Leave for non-Xenophobic reasons need to ask whether they are happy living in a country where those views are legitimised. Finally, to win the referendum on the terms, Remain campaigners need also to devise a set of domestic social and economic policies that will enable the 52% to benefit from the open tolerant diverse EU economy and society that the Remainers see as the advantages of membership. People will not vote Remain to please us. So we need to show how Britain in the EU will be good for them and their children. That will require a new focus on early years and school education, removal of the barriers to growth, the better integration of immigrants into society. None of that is new. But the Leave vote was a clear statement that we are not doing it well enough. So I recommend that readers write to your MP and call for the real Brexit referendum on the terms to take place 12 to 18 months after Article 50 is invoked. It should be an amendment to the legislation to invoke Article 50. Remain is still hysterical and in denial. I am happy to guarantee the right of EU nationals already here to stay. Even Farage has said this. Theresa May has no plans to forcibly evacuate these people. She merely wants to delay a guarantee until the EU agrees a similar one for Brits now resident there. There is no racist plot. At this stage there is some uncertainty as to the future because (a) the Leave campaign was a coalition assembled around a single referendum question and not a government in waiting (b) because Cameron and Osborne ( our Remain government) had instructed the civil service not to draw up any contingency plans whatsoever and (c) because the final result will depend on a new prime minister and cabinet, not to mention negotiations. All this is obvious and straightforward. So is the constitutional position. The people have spoken. Parliament will carry out their instruction to implement Brexit. There will be no second referendum to overturn it and no general election till 2020. By then the EU will look very different and so too will the British economy and British political parties. In the meantime the greatest danger is of Remainers creating a new stab-in-the back legend like Hindenburg in 1918. Then the Jews were supposed to have betrayed the wonderful German Reich. Today the blame is placed on idiotic workers deceived by racist politicians who have betrayed a glorious EU. Putin believes that the great Soviet Union was betrayed in a similar way by traitors. The result in Germany and in Russia was/ has been the rise of fascism. Today, those who feel the EU–whatever its reality– was betrayed by liars, racists and idiots are in danger of creating their own version of fascism with their talk of overthrowing democracy– the referendum result–by whatever means. They should take care. Britain will not accept their fascism. In the next vote all British in Europe should be allowed to vote. Even those who live outside UK longer than 15 years but inside Europe. It is only fair if a referendum which will affect them, they can take part. If we could vote the first time there would be no Brexit. Four polls since Brexit all now put the REMAIN camp in front. There has been a steady change of mind since the referendum so that it is no longer possible to say this is the will of the people. The more polls the more it is clear that a small but sufficient number of leave voters have changed their mind. The will of the people, now, is not 3.8% majority for leave but between 3% and 9% majority for remain. And that is just analysing the polls of people who actually voted. If there were a second referendum it is likely that there would also be a greater turnout for remain in any case and that would probably give a much greater majority. The will of the people, now, is to remain, It changed within five days of the referendum.. The 3.8% majority was too small for it to give a totally secure decision of the people. See all the analysis on the http://www.no2brexit.com website. Reply to Adrian. Please stop and grow up. Polls shown on BBC Newsnight showed 2% on each side had changed their mind. But so what? Are we to have a referendum every day of the week when one side or the other thinks it has a temporary advantage? Should we re-run general elections every week as opinion polls change? You lost. Get used to the idea. You cannot say what the will of the people’s will be. Remember the last time? All the polls predicted a Remain win. So much for your argument. It’s true “Brexit means Brexit” – we cannot have a re-run referendum and must leave the EU. The question is, what next? We simply should have had 2 questions in the referendum The Leave/Remain one we had – and another, if we left, what would be best – an EEA Norway-style option or a Do-It-Yourself trade deal with negotiations with individual countries. The 48% who voted Remain would no doubt opt for this option, as would many Brexit voters – for whom sovereignty not migration was the number one issue. We have to be honest and accept that net migration simply isn’t going to come down to tens of thousands – it hasn’t from outside the EU – where we have control. Many Brexit supporters will be upset by this – but frankly, they were misled. There is trade off – economy or immigration. 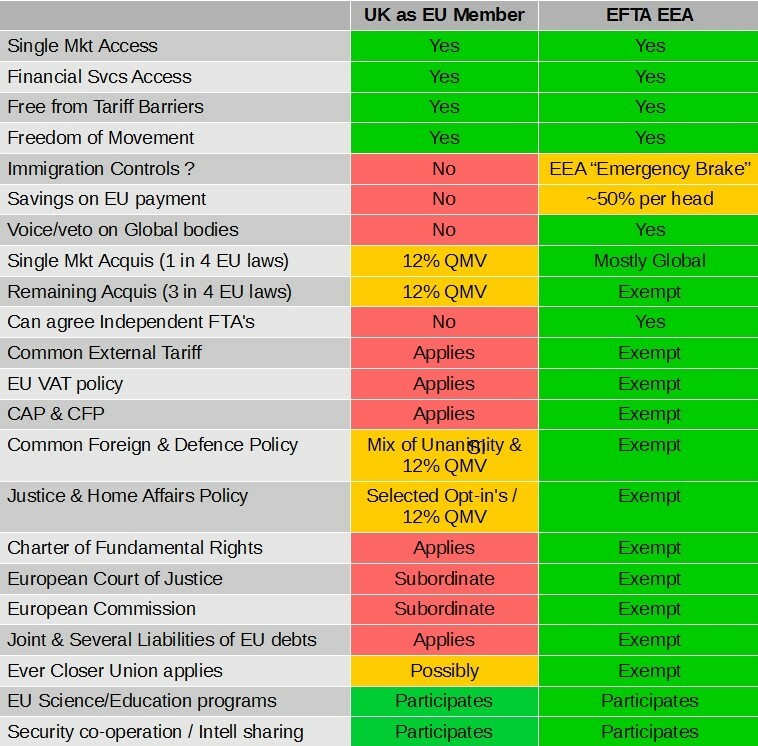 Most will now vote for economic benefits and security of EEA membership over the uncertainty of the alternative. The position is now that seven out of the last eight polls show that the UK is not in favour of Brexit. That is significant. When the ‘will of the people’ is measured in a referendum and the day after sufficient LEAVERS for a reversed decision are already saying that had they known the result they would have voted differently, there is something deeply wrong with a democratic system that ignores that. It may have been a wish to give the government a good kicking in an opportunistic protest vote that backfired, but overall it seems the country is not now in favour of leaving the EU. It is foolish simply to ignore that fact. This is not like a general election, as Mr Sked suggests. They are reversible every five years, this is not, it is set for the foreseeable future. When the decision is very close in a general election, in the past, it would mean a second election often in the same year. More recently it meant a mid-way coalition. Sometimes, the government would be defeated in a confidence vote and that would lead to a new vote. This is not like that at all. Either we are a democratic society which does listen to the will of the people and recognise, in this case, that the closeness of the result does not give a categorical mandate for such a fundamental change when 7 out of 8 polls now show vote would go the other way or we bamboozle our way to exit blithely ignoring the polls. That ignorance of the fact is neither ethical nor democratic. And what if the vote was leave again? Do you want a third vote? People fought for this country to secure our DEMOCRACY, the exact reason why we should no longer be a part of what has become a superstate. Also, the whole “people steal our jobs concept” is massively oversimplified. People from countries with a lower living cost can afford to do, for example, cleaning jobs in the UK, on ridiculously low wages. If they weren’t here and prepared to do that, guess what would happen? Companies would actually have to start paying an actual decent living wage for those kinds of jobs and people in this country may actually be able to support a family on that wage. It’s nothing to do with not welcoming people into this country, it’s the fact that companies are allowed to take advantage of that and drive wages down. Furthermore, our healthcare, education and housing systems can’t support an infinite amount of people; that’s not racist it’s common sense. We should continuing welcoming people to this country, but in a controlled manner and not to solely benefit the establishment and “big” business. The absolutely appalling “deal” we’ve been offered is worse than what we currently have. Our corner was fought atrociously, a sneaky last ditch last ditch attempt from the establishment to get a bad deal and entice a second referendum. Let’s have a no deal Brexit if it comes to it, see if the EU put tariffs up despite the fact they exported £67 billion worth of goods more than we did to them last year. That obviously just wouldn’t happen and it’s incredibly frustrating that the basic facts aren’t explained to people and they don’t understand this, so people on both sides undoubtedly voted for misinformed reasons. However, I for one as a young, 21 year old voter am more scared of losing my democracy than anything else that could happen. If this vote is overturned I’ll never vote again and I’m sad at what we’ve become as a country. Fight back against the establishment, make your voice heard and make sure we leave this car crash and preferably get a new political party soon who are actually in favour of normal people.